Unless you have hours of time on your hands then it’s difficult keeping up with all the latest updates to Facebook. So, to help you we’ve pulled together the latest updates that we think you need to know. 1) Facebook now has 1.94 billion monthly active users! Facebook recently released its first quarter earnings report. The number of Facebook’s monthly active users has grown by 17% compared to the first quarter of 2016. Instagram’s has also hit the milestone of 700 million monthly active users. 2) Video Cover images: Facebook confirmed it was testing a feature that will allow page owners to use videos they have uploaded as cover images. Have you seen the feature on your business page? 3) More content sharing: Not just for photos anymore, now people can include videos, check-ins, text posts and more in their albums. Gone on a trip recently? Share videos of you, your check-in at the destination, a photo of you there all in a single album. 4) Follow and unfollow specific albums: People now have the option to follow (or unfollow) a friend’s album to avoid missing any new posts. So, never fear that you are missing an update on your friend’s new baby. You can follow their album and see all new updates to that album in your News Feed. Remember that notifications for specific albums can always be turned on/off. 5) Facebook Dynamic Ads let advertisers create remarketing ads based on the person’s browsing history on a website. 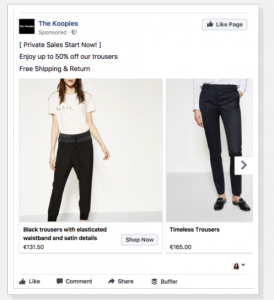 If a users visits an eCommerce website, they could be retargeted with a multi-product ad of the exact products they looked at. You can now highlight up to 20 images to represent a single item across the carousel ad format used with Dynamic Ads. This means that you can advertise a single item such as a piece of clothing, recipe, hotel or destination with multiple images, making your remarketing ads even more efficient. 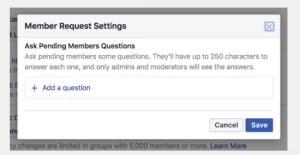 7) New entry questions for Facebook Groups: If you’re an admin of Facebook groups, then this will be of interest. You will now have the ability to set up to three questions for people requesting to join your Group to answer. As reported by TechCrunch, this lets admins screen potential members to ensure they’re the right fit for the group and will add constructively to the discussion, not just spam or troll the Group. Get in touch and let us support you with your social media – contact the team on 01904 863511 or email info@pickandmixms.co.uk.